Three hundred years ago, the southern Appalachians were home to the sovereign Cherokee Nation. Over fifty towns and settlements were connected by a well-worn system of foot trails, some of which later became wagon roads turnpiked by Cherokee turnpike companies. This Indian trail system, which climaxed around 1800, was the blueprint for the basic circuitry of the region’s modern road and interstate system. Stagnant European economies and the discovery of new natural resources sparked competitive world markets that led to wars between nations to procure land, gold, furs and slaves from North America. By the 1700’s, the British, French and Spanish were fighting for control of the modern Southeast. The early Indian trails had evolved logically and inevitably— the result of thousands of years of Native Americans’ interactions with animals, tribal migration, relocations, population shifts, and lifestyle changes due to European contact and trade. They evolved within a landscape of obstacles and destinations, following corridors that combined efficiency with the path of least resistance. Geological features were the key factors that led to the establishment and development of village sites and trail locations. Dividing ridges, passes and gaps, springs, river shoals, shallows, waterfalls, fords, and valleys all determined ultimately where trails and sometimes even tribal boundaries were established. Travel routes considered good camping sites with springs and sometimes natural shelters, such as rock overhangs along bluffs. Deerskins had become the material of choice for the “designer jeans” of the day. Fad and fashion in the streets of London were the beginning of the end of freedom for the Native Americans from whom we inherited our first road system. From the late 1690’s on there was fierce competition between the French and the English to monopolize the trade of the Native Americans. The demand for deerskins would seduce the Indian tribes of the Southeast into a dependency on manufactured European trade goods. Pack trains leaving from Charles Town, South Carolina delivered manufactured European goods such as metal pots, cloth, knives, blankets, guns, powder balls, and rum. Traders returned laden with deer, beaver, bear, and other animal skins. Deerskins served as currency, and the value of a traded item was measured in deerskins. In 1732 a pistol traded for five buckskins or ten doeskins, and a knife for two buckskins or four doeskins. 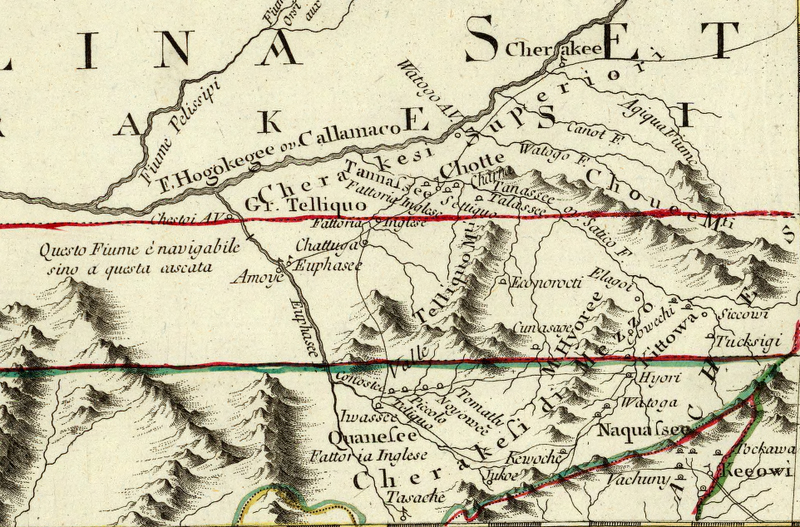 The Cherokee Nation was divided into clusters of towns that were separated by mountain ranges. The national hub was centered in western North Carolina. Trails radiated out in every direction. The Overhill towns on the Tennessee River just south of Knoxville connected with the Valley Towns near Murphy, which connected with the Middle Towns near Franklin and Bryson City. The Lower Towns lay between Charles Town, South Carolina, and the Middle Towns. Treaties and cessions driven by rich political land speculators paved the way for white planters and traders to eventually reach the escarpment of the Appalachians and Blue Ridge. This mountain range was the final barrier to the Cherokee heartland along the Little Tennessee, Valley, Tuckasegee and Hiwassee River bottoms. Beyond the mountains to the west and north lay the Tennessee and Kentucky hunting grounds. For a time, the Appalachian Mountains were an insurmountable obstacle to white expansion. But “hide hunters” like Daniel Boone and others coveted the buffalo and other game that abounded in the “Kaintucke” wilderness and the discovery of the Indian passage across the Cumberland Gap changed the course of history in British expansion in the Appalachians. In 1775, while in the employment of a land speculation company known as the Transylvania Company, Boone traveled from Fort Chiswell in Virginia, through the Cumberland Gap and into central Kentucky. From the Cumberland Gap to Flat Lick, Kentucky, Boone’s Trace followed a well-established Indian trail. Leading a team of thirty-five loggers, the path was widened through the forests along the borders of Tennessee, Kentucky, and Virginia. This became known as the Wilderness Road. In the 1790’s the Wilderness Road was widened again to accommodate wagons. An estimated 200,000 to 300,000 white settlers poured through the Cumberland Gap before 1810. Another principal travelway was the Great Warpath, which connected the Gulf of Mexico with the Great Lakes. It skirted the Great Smoky Mountains on the western flank. Later, sections of it became the Federal Road in Tennessee. Ted Franklin Belue, noted in The Long Hunt, “Alabama Creeks hunkered along its bends to attack the Overhill Cherokees who lived in the Blue Ridge. The war road led to Long Island, in east Tennessee, then forked. One prong went past the Holston Valley to what is now Saltville, Virginia; the other cut into Pennsylvania.” As with other war roads, some of the trees along the Great Warpath were marked with blazes, and with hieroglyphics smeared with red paint. Where these trails today remain natural and un-obliterated, old beech trees with carvings and trail marker trees might still be found nearby. Abandoned segments meander through fields and forests, and loops that followed the natural contours of the land can be seen departing from modern roads that were built on top of them. Today, it is not uncommon to find abandoned road banks that are ten or fifteen feet deep. 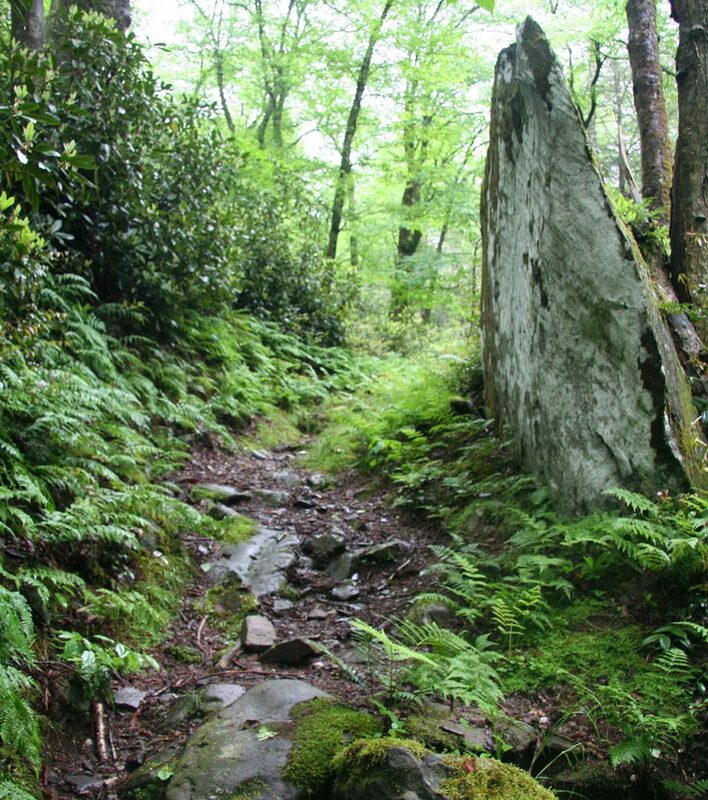 A principal example is the Natchez Trace in Tennessee and Mississippi yet there are perhaps thousands of remnants and hundreds of miles of preserved trails in the backwoods of Appalachia.